FBI Director James Comey confirmed Monday that the bureau is investigating possible links and coordination between Russia and associates of President Donald Trump as part of a broader probe of Russian interference in last year's presidential election. Comey also said he and the Justice Department have no evidence to support claims Trump has made that former President Barack Obama wiretapped Trump Tower. The extraordinary revelation of an investigation came at the outset of Comey's opening statement in a congressional hearing examining Russian meddling and possible connections between Moscow and Trump's campaign. He acknowledged the FBI does not ordinarily discuss ongoing investigations, but said he'd been authorized to do so by the Justice Department, given the extreme public interest in this case. "This work is very complex, and there is no way for me to give you a timetable for when it will be done," Comey told the House Intelligence Committee, adding that he cannot discuss whose conduct is being examined and asking that the public not speculate about why he cannot comment further. FBI Director James Comey said that there was no evidence that phones at Trump Tower were wiretapped. "I have no information that supports those tweets and we have looked carefully inside the FBI," Comey said, referring to Trump's tweets that make the wiretapping claim. "I can promise you we will follow the facts wherever they lead," he said. "I have no information that supports those tweets, and we have looked carefully inside the FBI," Comey said. The same was true, he added, of the Justice Department. He also disputed allegations that British intelligence services were involved in the wiretapping. He did not say whether Trump Tower was the subject of other surveillance, but he asked that no one read into those comments. Republicans on the committee asked a series of questions probing the leaks of classified information in connection with the alleged Russian election meddling, something Trump railed against early Monday morning. Senators from both sides of the aisle called for an independent investigation into Michael Flynn after he resigned from his post as President Donald Trump's national security advisor on Monday night. 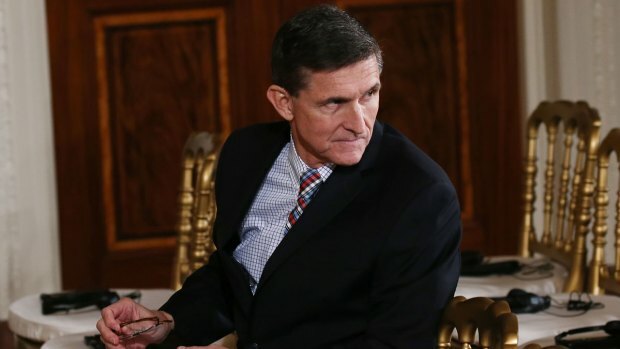 Flynn was found to have misled Vice President Mike Pence and other officials about discussing sanctions with Russia's ambassador. Trump was informed Flynn had misled Pence but the president kept his No. 2 in the dark and waited nearly three weeks before firing the aide. Comey and National Security Agency Director Michael Rogers, who was also testifying, said they were against leaks of classified information, though the classified nature of information prevented them from commenting in detail. White House press secretary Sean Spicer played down the influence of prominent Trump campaign officials named in the hearing, calling former national security adviser Michael Flynn "a volunteer of the campaign" during the election. Manafort issued a statement Monday defending himself against suggestions he played a part. He said he had "no role or involvement" in the DNC cyberhack or disclosure of stolen emails. Asked whether Trump still has confidence in Comey, Spicer said, "There's no reason to believe he doesn't at this time." Rep. Devin Nunes, the California Republican who chairs the committee, noted in his opening statement that there was no physical wiretap on Trump Tower — also contradicting the assertion made by Trump — but added that it's possible that "other surveillance activities" were used against Trump and his associates. 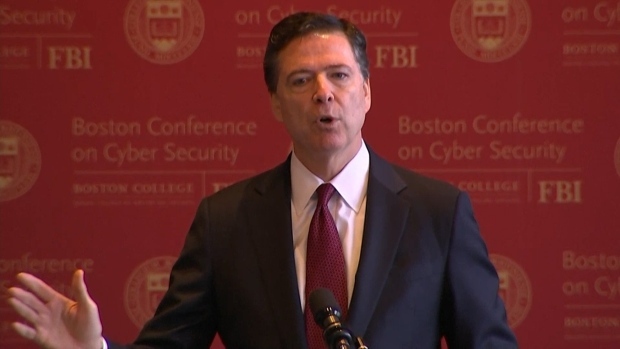 FBI Director James Comey spoke at a cybersecurity conference at Boston College Wednesday, addressing current encryption software, the idea of privacy in the modern age and how the FBI can improve its fight against cyberthreats. Schiff, the committee's Democratic co-chair, laid out circumstantial evidence of collusion he referred to this weekend, saying that, if it occurred, it would "represent one of the most shocking betrayals of democracy in history." Trump offered a "fake news" pre-buttle Monday morning on Twitter, citing Obama's top intelligence official, James Clapper. Trump said "there is no evidence Potus colluded with Russia" and again alleged, without evidence, that the Russia allegations were made up by Democrats to distract from their loss in the election. He said "the real story" is leaking of classified information. Schiff and Nunes had said Sunday that documents the Justice Department and FBI delivered late last week offered no evidence that the Obama administration had wiretapped Trump Tower, the president's New York City headquarters, but the panel's ranking Democrat says the material offers circumstantial evidence that American citizens colluded with Russians in Moscow's efforts to interfere in the presidential election. At a hearing in January, Comey refused to confirm or deny the existence of any investigation exploring possible connections between Trump associates and Russia, consistent with the FBI's longstanding policy of not publicly discussing its work. His appearances on Capitol Hill since then have occurred in classified settings, often with small groups of lawmakers, and he has made no public statements connected to the Trump campaign or Russia. NBC's Asher Klein contributed to this report.